Photo: Formula Drift star Tyler McQuarrie in the No.19 LPL Lotus Exige S on his way to his second podium finish of the weekend in Mosport. (Mark Webber photo). 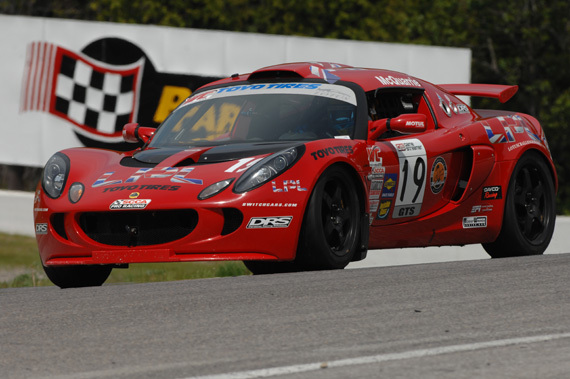 May 23, 2010 (Mosport, Ontario) – For the second straight day, Formula Drift star Tyler McQuarrie wheeled the No.19 LPL Lotus Exige S to a second-place finish in the World Challenge GTS class at the Victoria Day Speedfest presented by Optima Batteries at Mosport International Raceway. Unlike Saturday, however, McQuarrie secured pole position with a blistering 1:30.478, his second GTS pole position in three races. Gridded right behind him was Saturday winner John Heinrecy and multi-time champion Peter Cunningham, setting up an interesting race among three cars with differing levels of power and handling capabilities. McQuarrie made the best start but was unable to stay in the lead on the first lap, as the Lotus Exige S could not match the power of Heinrecy’s Corvette down the long Andretti Straightaway. McQuarrie was able to catch and pressure Heinrecy throughout the rest of the course, but each lap Heinrecy would pull out an advantage on the straightaway. As the race wore on, McQuarrie had to defend second position from Cunningham, whom he had a race-long battle with in Saturday – and much like Saturday, the two traded positions and ran side-by-side through several corners. And, like Saturday, McQuarrie crossed the finish line in second place, taking his third podium in three World Challenge GTS races. “There wasn’t much I could do about the power of the Corvette,” said McQuarrie. “We had him covered everywhere else but he was able to stay ahead and then get a big gap down the straightaway. When Peter caught me it made for a really fun race, we ran side by side through half the track. I got a great run down the back straightaway and got underneath him in turn nine. His results move McQuarrie to third place in the GTS points standings, and he is the highest placed rookie in the championship. LPL Motorsports is currently planning to continue with the World Challenge season and welcomes inquiries from drivers interested in partnering McQuarrie in a second Exige S. For more details about the LPL Motorsports program, contact Efrain Olivares at efrain@shiftgroup.net.